T he human body cannot survive for more than a very few minutes in an environment that lacks oxygen. Oxygen is required for the normal functioning of all living body cells. This vital gas reaches the body cells via the bloodstream; each red blood cell transports oxygen molecules to the body tissues. The oxygen comes from the atmosphere one breathes, and it enters the bloodstream through the very thin membrane walls of the lung tissue, a fresh supply of oxygen entering the bloodstream each time a person inhales. As the red blood cells circulating through the walls of the lung tissue pick up their fresh supply of oxygen, they release molecules of carbon dioxide given off by the body cells as a waste product of metabolism. When a person exhales, the lungs are squeezed somewhat like a bellows, and the carbon dioxide is expelled from the lungs. The automatic action of breathing in and out is caused by the alternate contraction and relaxation of several muscle groups. The main muscle of breathing is the diaphragm , a layer of muscle fibers that separates the organs of the chest from the organs of the abdomen. Other muscles of respiration are located between the ribs, in the neck, and in the abdomen. As the diaphragm contracts to let the lungs expand, the other muscles increase the capacity of the thorax , or chest cavity, when one inhales. The muscles literally squeeze the lungs and chest when an individual exhales. Any disease of the muscles and bones of the chest wall or of the passages leading from the nose to the lung tissue—containing the small air sacs where the gases are actually exchanged—will interfere to some extent with normal function. As with any organ of the body, there is a great reserve built into the lungs that assures that small to even moderate amounts of diseased tissue can exist without compromising their ability to sustain life. 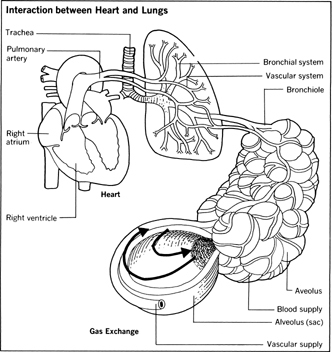 However, when disease of the lungs, air passages, thoracic (rib) cage, or any combination of these parts decreases the capacity of the reserve areas, then the oxygen supply to all the organs and tissues of the body becomes deficient, and they become incapable of performing their vital functions. Diseases of the thoracic cage are relatively uncommon. Certain forms of arthritis cause fixation of the bony cage and limit expansion when breathing. Various muscle and nervous system diseases weaken the muscles used to expand the chest for breathing. Diseases of the bronchi or air passages tend to narrow those tubes and thereby limit the amount of air that can pass through to the tiny alveoli , or air sacs. 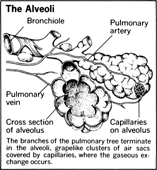 Other conditions affect the alveoli themselves, and, if widespread enough, allow no place for the oxygen and carbon dioxide to be exchanged. The most common forms of lung disease are infections caused by viruses, bacteria, or fungi. Infection is always a potential threat to the lung because this organ is in constant contact with the outside air and therefore constantly exposed to infectious agents. It is only through elaborate defenses that the body is able to maintain normal functions without interference by these agents. The major defenses are simply mechanical and consist mainly of the hairs in the nose and a mucous blanket coating the inside of the bronchi. The very small hairs (called cilia ) in the breathing passage act as a filtering system; mucous membranes of the bronchi help to intercept small particles as they are swept along by the action of the cilia. Whenever these structures are diseased, as in chronic bronchitis, there is a much greater likelihood of acquiring infection.